Background and objectives The self-management and decision-making skills required to manage CKD successfully may be diminished in those with low health literacy. A 2012 review identified five papers reporting the prevalence of limited health literacy in CKD, largely from United States dialysis populations. The literature has expanded considerably since. Design, setting, participants, & measurements We used systematic review, pooled prevalence analysis, metaregression, and exploration of heterogeneity in studies of patients with CKD (all stages). Results From 433 studies, 15 new studies met the inclusion criteria and were analyzed together with five studies from the 2012 review. These included 13 cross-sectional surveys, five cohort studies (using baseline data), and two using baseline clinical trial data. Most (19 of 20) were from the United States. In total, 12,324 patients were studied (3529 nondialysis CKD, 5289 dialysis, 2560 transplant, and 946 with unspecified CKD; median =198.5; IQR, 128.5–260 per study). Median prevalence of limited health literacy within studies was 23% (IQR, 16%–33%), and pooled prevalence was 25% (95% confidence interval, 20% to 30%) with significant between-study heterogeneity (I2=97%). Pooled prevalence of limited health literacy was 25% (95% confidence interval, 16% to 33%; I2=97%) among patients with CKD not on dialysis, 27% (95% confidence interval, 19% to 35%; I2=96%) among patients on dialysis, and 14% (95% confidence interval, 7% to 21%; I2=97%) among patients with transplants. A higher proportion of nonwhite participants was associated with increased limited health literacy prevalence (P=0.04), but participant age was not (P=0.40). Within studies, nonwhite ethnicity and low socioeconomic status were consistently and independently associated with limited health literacy. Studies were of low or moderate quality. Within-study participant selection criteria had potential to introduce bias. Conclusions Limited health literacy is common in CKD, especially among individuals with low socioeconomic status and nonwhite ethnicity. This has implications for the design of self-management and decision-making initiatives to promote equity of care and improve quality. Lower prevalence among patients with transplants may reflect selection of patients with higher health literacy for transplantation either because of less comorbidity in this group or as a direct effect of health literacy on access to transplantation. CKD affects 12% of United States adults and is associated with significant morbidity and mortality, predominantly through increased cardiovascular risk (1). CKD progression further increases cardiovascular risk (2) and the risk of requiring RRT (3). CKD management aims to reduce these risks and prepare people with advanced CKD for dialysis, transplantation, or conservative care (4). Increasingly, CKD management involves shared decision-making and self-care activities, which are actively promoted in health care policy (5,6). However, these activities require patients to learn, understand, appraise, and apply knowledge of a complex disease process and its treatment. As CKD progresses, the burden of self-management activities increases, whereas patients’ capacity (7,8) to perform these activities may reduce because of disease-related reduction in function (9). Furthermore, CKD is associated with low socioeconomic status (SES) (10), and therefore, people with CKD may lack the social resources needed for successful CKD management (8). Effective self-management may, therefore, depend on individual skills in managing health, such as health literacy (11). Health literacy is a personal attribute that “entails people’s knowledge, motivation and competences to access, understand, appraise and apply health information” (12). As a potentially modifiable factor influencing individual health, it is the focus of an expanding field of research. Multiple tools have been developed to measure health literacy or screen for low or “limited” health literacy (13). In general populations, limited health literacy is associated with poorer health (14), less efficient use of health care services (15), and higher mortality (16). However, investigation of limited health literacy in CKD has been relatively limited: a 2012 systematic review identified four studies of patients on hemodialysis, one study of patients with transplants, and one including patients with early CKD (17). Only 1405 patients were studied in total. Limited health literacy was associated with lower SES (18–20) and increased comorbidity (19). One study showed increased mortality among patients on dialysis with limited health literacy (21). The review identified a need for studies measuring health literacy among patients with CKD stages 1–4 and studies from outside the United States. Since this review, investigation of limited health literacy as a barrier to effective clinician-patient communication has been identified as a research priority in CKD (22). Health literacy measures specific to CKD have been developed and validated (23,24). A Cochrane review of health literacy–focused interventions in CKD is underway (25). We recognized that health literacy research in CKD had increased significantly. This study aimed to 1) re-explore the prevalence and sociodemographic associations of limited health literacy among patients with CKD, 2) compare the prevalence of limited health literacy between patients with nondialysis CKD, patients on dialysis, and patients with a kidney transplant, and 3) identify causes of heterogeneity in reported results. The review protocol was registered with the international prospective register of systematic reviews (http://www.crd.york.ac.uk/PROSPERO; registration number D42016036742). English language references from between December of 2010 and July of 2016 were identified from Medline, Embase, Ovidfulltext (including Psycharticles), Health Management Information Consortium, Cumulative Index to Nursing and Allied Health Literature, and Psychinfo. The search strategy (Supplemental Material, Supplemental Figure 1) was developed from the 2012 review, a Cochrane systematic review protocol for health literacy interventions in CKD (25), and review articles of health literacy measurement tools (23,26–31). In addition to database searches, reference lists from articles included in this review and from other review articles were hand searched. Two reviewers (D.M.T. and S.F.) independently assessed journal articles for inclusion by three criteria. (1) At least 50 adults over 18 years old with CKD were included (aiming to identify studies with a predominantly quantitative rather than qualitative focus). (2) The study used a validated measure to quantitatively describe health literacy. (3) The study reported the prevalence of limited health literacy or data from which this could be derived. Full texts of journal articles were reviewed if the first criterion and either of the other two were met. Authors were contacted if required to establish if a study should be included or request additional data. Articles that met the inclusion criteria were analyzed along with the five articles included in the 2012 review. In a sensitivity analysis, searches were widened to include unpublished studies available as abstracts from nephrology and health literacy conferences. Study quality was scored independently by D.M.T. and S.F. guided by a review of tools for assessing the quality of observational studies (32). Studies were assigned scores for sample size, setting, recruitment methods, and potential for unrecognized confounding of results. Scores were combined to indicate study quality and used to inform grading of studies as low, moderate, or high quality. However, this scoring acted as a guide only, and grading of studies was decided by discussion between the two reviewers. For each study, the prevalence of limited health literacy, number of unique participants, study methods, and demographics of participants were recorded. A meta-analysis was performed with subgroup analysis by CKD treatment stage (nondialysis CKD, dialysis, or transplant) and health literacy measure. Results were presented as Forest plots, with 95% confidence intervals (95% CIs) for each prevalence value and the pooled prevalence of limited health literacy. I2 statistics were calculated to measure the degree of heterogeneity between studies and subgroups. A random effects model was used, because we expected to find significant heterogeneity in the prevalence of limited health literacy on the basis of the results of the 2012 review (9). Univariate metaregression was performed for continuous variables, which included the proportion of patients with nonwhite ethnicity and the age of participants (mean or median). If data on treatment stage, age, or ethnicity were unavailable, studies were excluded from each analysis. For studies where more than one validated health literacy measure was used, scores from the Short Test of Functional Health Literacy in Adults (STOFHLA) are presented here because of its use as a reference measure to validate health literacy screening tools (23,24,33). Analyses were then repeated using scores from other measures to establish if this altered the overall results. Sociodemographic characteristics significantly associated with limited health literacy were summarized, with covariates included in multivariate models, to identify independent associations. Statistical significance within studies was defined by individual study methods. A P value of <0.05 was selected a priori to define statistical significance for meta-analysis and metaregression. Analyses were performed using the user-written commands metaprop and metareg in Stata 12 (StataCorp LP). Figure 1 shows the study selection process, which identified 433 unique studies, 15 of which met the inclusion criteria (23,24,34–46) with full agreement between the two reviewers. Table 1 summarizes the 15 new studies in addition to five studies included in the 2012 review (18–21,47). All 20 studies are included in the following description and analysis. Study selection process. HL, health literacy. Of 20 studies, 13 were cross-sectional surveys, five used baseline data from cohort studies, and two used baseline data from clinical trials. One study presented United Kingdom data (44), and all others reported from the United States. Study quality was graded as low for 15 studies and moderate for five studies (18,21,42–44). In total, 12,324 patients were studied, including 1327 patients included in the 2012 review. This included 3529 patients with nondialysis CKD from seven studies, 5289 patients on dialysis from ten studies, and 2560 patients with transplants from five studies. Five studies included patients from multiple treatment stages. The prevalence of limited health literacy by treatment stage was not available for 946 patients from two studies (40,41), even after communication with authors. Studies included a median of 198.5 patients (interquartile range [IQR], 128.5–260). One study included live kidney donors (36), and one included recipients of solid organ transplants of different types (41) in addition to patients with CKD; subgroup information was available from published data. One study (40) measured health literacy in 46,000 emergency department attendees, including 851 with CKD (40). The authors provided data on this subgroup by personal communication (C. McNaughton). Table 2 summarizes the health literacy measures and definitions of limited health literacy used. One study included all emergency department attendees (40), and one aimed to approach all eligible patients across the United Kingdom (44). Two studies surveyed patients from clinical trials for primary objectives that were unrelated to health literacy (19,34). All others recruited from clinical environments without efforts to obtain a sample representative of a target CKD population. Two studies surveyed patients with CKD at transplant assessment clinics (37,41), whereas one excluded patients listed for transplant (19). Three studies reported offering a monetary gift to participants (45–47). At least 11 studies excluded patients with cognitive impairment. One study included patients deemed suitable for an educational intervention (21). Six studies specified an upper limit for age, ranging from 74 to 80 years old (20,23,35,42–44). Ethnicity data were unavailable for one study (total of 95 patients) (41), and age data were unavailable for two studies (total of 322 patients) (24,41). From the remaining data, the median proportion of participants of nonwhite ethnicity was 48% (IQR, 23%–64%), and mean or median age ranged from 47 to 72 years old. In some United States studies, the majority of study participants had black ethnicity (20,23,39). One study excluded patients with Hispanic ethnicity (42). Twelve studies included only English speakers. Three studies included Spanish speakers and used health literacy measures translated into Spanish (24,39,43). The median prevalence of limited health literacy by study was 23% (IQR, 16%–33%). The overall pooled prevalence of limited health literacy was 25% (95% CI, 20% to 30%). A high degree of heterogeneity was present between studies (I2=97.4%). Figure 2 shows a Forest plot of the prevalence of limited health literacy in all 20 studies with subgroup analysis by health literacy measure. Studies using the Newest Vital Sign (NVS) and the Single-Item Literacy Screener (SILS) reported significantly different prevalence values, but only one study used each measure (38,44). These prevalence values contributed to the significant overall heterogeneity in limited health literacy prevalence between studies using different measures (P<0.001). However, when studies using the Rapid Estimate of Adult Literacy in Medicine (REALM), the STOFHLA and the Brief Health Literacy Screen (BHLS) were compared alone, no significant between-group heterogeneity was detected (P=0.80). Overall pooled prevalence of limited health literacy is 25%; there was no significant difference between pooled prevalence estimates from studies using REALM, STOFHLA and BHLS. Dashed reference line indicates pooled prevalence value. BHLS, Brief Health Literacy Screener; 95% CI, confidence interval; HL, health literacy; NVS, Newest Vital Sign; REALM, Rapid Evaluation of Adult Literacy in Medicine; SILS, Single-Item Literacy Screener; STOFHLA, Short Test of Functional Health Literacy in Adults. Figure 3 shows subgroup analysis by CKD treatment stage, excluding two studies where subgroup information was unavailable (40,41). The pooled prevalence of limited health literacy was 25% (95% CI, 16% to 33%) among patients with nondialysis CKD, 27% (95% CI, 19% to 35%) among patients on dialysis, and 14% (95% CI, 7% to 21%) among patients with transplants. Overall, there was significant between-group heterogeneity (P=0.03), although this seems to be related to the lower prevalence of limited health literacy in patients with transplants: when patients with nondialysis CKD and patients on dialysis were compared separately, no significant between-group heterogeneity was present (P=0.80). The pooled prevalence of limited health literacy is significantly lower in transplanted patients compared to those with nondialysis CKD or on dialysis. Two studies where treatment stage was not defined are not shown. BHLS, Brief Health Literacy Screener; 95% CI, confidence interval; HL, health literacy; NVS, Newest Vital Sign; REALM, Rapid Evaluation of Adult Literacy in Medicine; SILS, Single-Item Literacy Screener; STOFHLA, Short Test of Functional Health Literacy in Adults. Univariate metaregression analysis showed a significant association between the proportion of nonwhite participants in a study and the prevalence of limited health literacy (β=0.35; 95% CI, 0.00 to 0.69; P=0.04). This equates to a 3.5% increase in the prevalence of limited health literacy for every 10% increase in the proportion of nonwhite participants. Average age of study participants was not significantly associated with the prevalence of limited health literacy (β=1.05; 95% CI, −0.5 to 2.6; P=0.40). Two studies used multiple health literacy measures, reporting three limited health literacy prevalence values each (23,24). In the above analyses, results defined by the STOFHLA were used for both studies. Repeated analyses using each of nine possible combinations of limited health literacy prevalence values did not lead to a change in the significance of the above results, except for metaregression by proportion of nonwhite participants. In four of nine combinations, this association was no longer statistically significant. A further sensitivity analysis included 11 conference abstracts in addition to the 20 published papers included here (Supplemental Material, Supplemental Table 1). Analysis of results from all 31 studies showed a pooled prevalence of limited health literacy of 25% and no change in the pattern of results as presented above. However, when abstracts were included, the significance of the association between proportion of nonwhite participants and limited health literacy prevalence increased (P=0.01). Table 3 summarizes significant associations with limited health literacy and covariates included in multivariate models. A large variety of variables was tested. In ten studies that undertook multivariate analysis, the only demographic factors consistently and independently associated with limited health literacy were ethnicity (19,21,34) and markers of lower SES, including income (18,20,34) and lower educational level (18–21,36,44). Independent associations were also reported between limited health literacy and older age (20), men (21), lower English fluency (44), individual comorbidities (38,42), and higher comorbidity score (44). Summary of univariate and multivariate associations with limited health literacy. In patients with nondialysis CKD, two studies reported independent associations between limited health literacy and lower eGFR (38,42). Limited health literacy was associated with deceased donor transplantation (compared with live donor) and transplantation after dialysis start (compared with preemptive) (44). One study reported an independent association between limited health literacy and mortality (21). 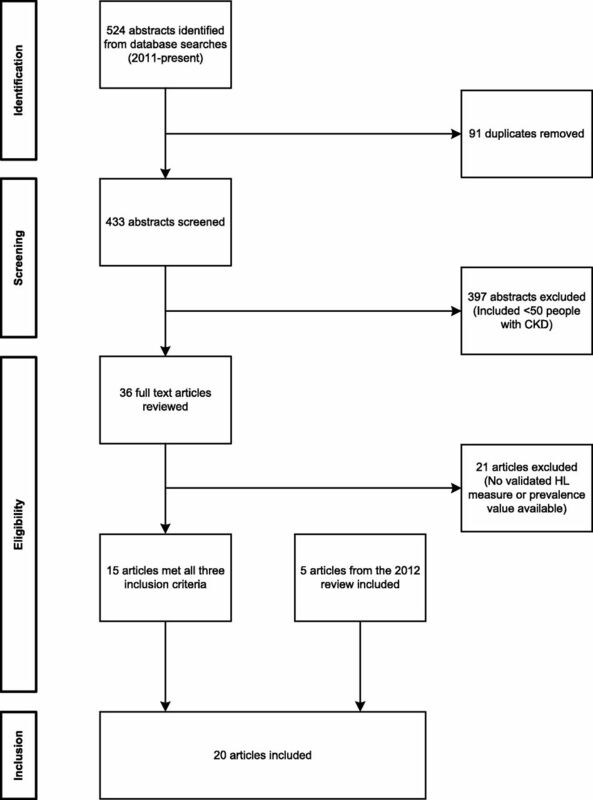 This systematic review of literature published until mid-2016 shows the significant expansion of health literacy research in CKD. Fifteen studies published since 2012 were identified, and 12,324 patients have now been studied compared with 1405 in the 2012 review by Fraser et al. (17). Geographical variation of studies remains limited: only one was from outside the United States. The pooled prevalence of limited health literacy in this analysis was 25%, similar to 23% in the 2012 review. The six new studies of patients with nondialysis CKD and four new studies of patients with transplants allowed meta-analysis by patient group, confirming the reduced prevalence of limited health literacy among patients with transplants, which has been reported in individual studies (44). Four new studies used the BHLS, and comparison with studies using the REALM and the STOFHLA showed no significant difference in limited health literacy prevalence, increasing the confidence with which results can be compared between studies of patients with CKD using these health literacy measures. The lower prevalence of limited health literacy among patients with kidney transplants has several possible explanations. Limited health literacy may directly impede effective clinician-patient communication, reducing the likelihood of clinically suitable patients understanding the benefits of transplantation and pursuing it as a treatment option. Because of associations with low SES, limited health literacy has been implicated as a possible mediating factor in reducing access to transplantation. However, mechanisms by which low SES associates with reduced access to transplantation (48) are complex [and in the United States, include reduced access to immunosuppressant drugs (49)]. The associations of both limited health literacy (44) and SES (50) with increased comorbidity add further complexity: patients with limited health literacy and low SES may, in fact, be less suitable for transplantation for clinical reasons. These complex associations warrant further investigation. A higher proportion of individuals with nonwhite ethnicity was significantly correlated with a higher prevalence of limited health literacy. Because 19 of 20 studies were from the United States, nonwhite ethnicity represents patients with black or Hispanic ethnicity. Nonwhite ethnicity in the United States has established complex associations with low SES (51) and poorer health outcomes (52), and therefore, this may represent confounding by SES and comorbidity. Although all three studies that reported independent associations between ethnicity and limited health literacy adjusted for SES (19,21,34), only one adjusted for comorbidity (as presence or absence of diabetes) (21). Age of study participants did not seem to influence the prevalence of limited health literacy. Even after adjustment for treatment stage, health literacy measure, age, or ethnicity, there was significant residual heterogeneity in the prevalence of limited health literacy between studies. Study methodology had potential to contribute to this heterogeneity. Sample size was mostly small (median =189). The majority of studies recruited patients by convenience in clinical environments, which may result in participation bias. Studies that included only patients who had been referred for transplantation (or excluded those who had been referred) are likely to produce biased estimates of limited health literacy prevalence (19,46,47). Patients with cognitive impairment or language difficulties may show a reduction in understanding and be falsely classified as having limited health literacy. Many studies excluded those with cognitive impairment for this reason, but some did not, and no associations between cognitive impairment and health literacy were tested. The approach to patients whose first language is not English could also bias results. Some studies excluded non-English speakers who would be more likely to have limited health literacy because of the association with nonwhite ethnicity and lower SES. Others used translated versions of health literacy measures to allow inclusion of non-English speakers. However, non-English versions of health literacy measures have not been validated extensively, and comparison of results between English and non-English versions is problematic because of inherent differences between English-speaking and non–English-speaking populations (53). Other studies used English health literacy measures for all participants, which could result in patients being falsely classified as having low health literacy because of poor understanding related to language. The different health literacy measures used vary in their method of assessment and the skills that are assessed. This limits comparability of results between studies. The REALM and the STOFHLA are direct assessments of pronunciation and reading comprehension, whereas the screening tools the BHLS and the SILS focus on patient perception of their level of understanding. 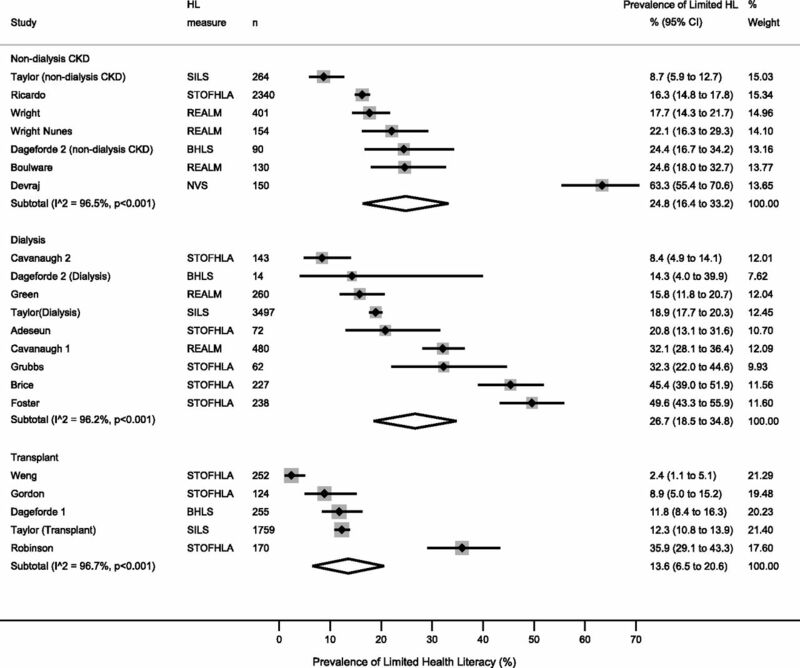 It is reassuring that the BHLS produced similar prevalence estimates to the REALM and the STOFHLA in our meta-analysis, although health literacy screening tools have been shown in validation studies of CKD and other populations to lack sensitivity and specificity in detecting limited health literacy defined by the REALM or the STOFHLA (23,24,33,54). Screening tools benefit from short administration times, and therefore, they are more practical for use in large-scale cohort studies or screening in clinical practice. The NVS (55) is the only measure used here that assesses poor numeracy: a common characteristic of patients with CKD (56) and other chronic diseases (57) that may impair patients’ ability to dose medications, follow dietary advice, and keep appointments (58). Systematic reviews of health literacy prevalence in other populations report similar findings. A 2005 review of United States studies reported a pooled prevalence of 26% “low” health literacy associated with lower educational level, black ethnicity, and older age (59). A review of health literacy in patients with musculoskeletal diseases found between 7% and 42% low health literacy associated with lower SES (60). This review benefits from a comprehensive search strategy using updated search terms. Eligibility criteria were clearly defined. We sought and received valuable communication from many authors, enhancing the quality of the review. A sensitivity analysis, which included data from conference abstracts, identified no major differences in results. There are several limitations. First, studies were of low or moderate quality because of small sample size, single-center samples, and nonrepresentative sampling methods. Second, studies using newer measures that measure multiple aspects of health literacy on separate scales (13) but do not define limited health literacy could not be included. Third, most studies used cross-sectional data, and the association of limited health literacy with increased mortality (21) could result in survivorship bias and an underestimate of limited health literacy prevalence in cross-sectional studies. Fourth, metaregression to account for age and ethnicity differences between studies was especially limited by missing data, and multivariate metaregression was not possible. However, a positive association was still shown between nonwhite ethnicity and limited health literacy prevalence, despite this lack of power. Fifth, ages of study participants were available as mean or median, limiting the reliability of metaregression analysis by age. Sixth, one study showed a lower prevalence of limited health literacy among those listed for transplantation compared with patients on incident dialysis (44), but this association could not be investigated here because of the absence of consistent data on wait-listing status. Clinicians should recognize that one quarter or more of patients with CKD have reduced health literacy skills. Standard shared decision-making and self-management initiatives may not be suitable (11,61). Furthermore, those with limited health literacy have an increased burden of disease and treatment due to comorbidity and may lack social resources required to manage disease because of low SES (7,8). In the face of these challenges, health literacy–sensitive communication methods, educational tools, and decision aids may be key to improving clinical outcomes and may have a role in reducing inequity in access to transplantation. The expansion of health literacy research in CKD since the last review is welcome, but further work is required to use this knowledge to promote improved clinical outcomes. All health literacy research will be facilitated by evidence-based consensus on the optimal tools to measure health literacy. Prospective studies are required to examine the effect of limited health literacy on health care service use, CKD management, and RRT modality choice (including nondialysis care). Interactions between health literacy and other patient attributes, such as capacity (8) and patient activation (62) ,warrant investigation. Knowledge of the mechanisms by which limited health literacy could impair navigation of the CKD care pathway will inform enhanced communication methods and modified approaches to shared decision making and self-management. By improving patients’ understanding, these initiatives would aim to reduce inequity of care and improve the health of the CKD population. C.B. received consulting fees (relating to diabetes; unrelated to this work) for one advisory board meeting and some consultancy fees from 2014 to 2016. She is the majority shareholder in Health Psychology Research Ltd. Her other research (not including this work) is funded by four grants from GlaxoSmithKline/ViiV. She receives royalties for the use of her patient-reported outcome measures, none of which are referenced in this manuscript (and none of which relate to health literacy). G.C.O. received royalties from book authorship (Wiley) unrelated to this manuscript. P.R. received grant support from Pfizer from 2012 to 2014 for an methicillin-resistant staphylococcus aureus Study unrelated to this manuscript. D.M.T., S.F., J.A.B., H.D., W.M., C.T., and R.R. report no conflicts of interest. This article presents independent research funded by the National Institute for Health Research (NIHR) under Programme Grants for Applied Research scheme RP-PG-0109-10116. The views expressed are those of the authors and are not necessarily those of the National Health Service, the NIHR, or the Department of Health. The funding body did not have any role in deciding study design, data collection, analysis, interpretation of data, writing the report, or decision to submit for publication. This article contains supplemental material online at http://cjasn.asnjournals.org/lookup/suppl/doi:10.2215/CJN.12921216/-/DCSupplemental.